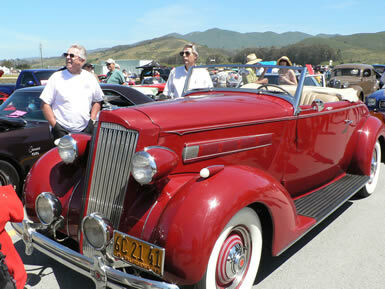 HALF MOON BAY, CALIFORNIA - "The Coolest Show on Earth"
Pacific Coast Dream Machines Show Returns to a Single-Day Mega-Show Format on April 27, 2014 at Half Moon Bay Airport with World-Class Cars, Fantastic Flying Machines, Custom Motorcycles and Quirky Contraptions. There are car shows, air shows, motorcycle shows, tractor shows, county fairs, music festivals, food festivals and living history festivals galore. Mix them all together in one venue on one day and you’ve got Half Moon Bay’s beloved, one and only, Pacific Coast Dream Machines Show, a massive celebration of mechanical ingenuity, power and style known as the “Coolest Show on Earth”. The spectacular 24th annual show will return to a single-day mega-show format on Sunday, April 27, 2014, from 10 a.m. to 4 p.m. at Half Moon Bay Airport, located in the picturesque seaside town of Half Moon Bay, CA about 20 miles south of San Francisco. An added bonus: the Tom Lantos Tunnels through Devil’s Slide on Highway 1 make driving to the show easier and more interesting than ever! This year's headline attractions include an impressive array of military aircraft including the P-38 Lightning, B-25 Bomber, P-51 Mustang, C-47 Skytrain and F-4 Corsair among others, a parade of dozens of one-of-a-kind vintage police cars, "Dynojet" dynamometer engine performance testing, world land speed record streamliners and hydroplanes, a special display of antique wooden boats, a multitude of Ford Mustangs to celebrate the iconic muscle cars' 50th anniversary, and an opening color guard to kick off the festivities. The Pacific Coast Dream Machines Show is a whimsical, fascinating, amusing, curious and absolutely unique show and tell spectacle featuring 2,000 magnificent driving, flying and working machines from the 20th and 21st centuries. The world's coolest cars of every era and style, model-T fire engines, vintage busses, custom motorcycles, tricked out trucks, super sleek streamliners, one-of-a-kind antique engines and tractors and historic military aircraft will be among the mesmerizing displays. It's one of the west coast's biggest and baddest gatherings of the world's coolest cars. Spectators will get a rare up-close look at antique horseless carriages and Ford Model T's, fanciful touring and luxury cars, powerful sports cars, custom cars and street rods, muscle cars, vintage and modern era high-performance race cars, quirky art and pedal cars, modified street machines with cutting edge styles, exotic high-performance cars, stylish European cars, ultra cool low-riders, sporty compacts, modified imports with flashy graphics, fashionable hip-hop urban show cars, homebuilt kit cars, super-charged turbo cars and trucks, “green” technology & alternative fuel vehicles, streamliners, dragsters, funny cars, gassers, and jet cars. Hundreds of aviation wonders are expected to be on display, stylish homebuilts, classics from the ‘40s and ‘50s, vintage warbirds, sport and ultralight aircraft. Highlights include jaw-dropping, shock and awe flyovers by historic military aircraft: the P-38 Lightning, B-25 Bomber, C-47 Skytrain and F-4 Corsair. Plus there's “Mustang Madness”, a spectacular display of America’s premier World War II fighter along with YAK Russian fighters and an impressive array of T-6 and T-28 military fighters and trainers. Thrilling rides will be offered in helicopters, vintage bi-planes, along with Beech 18 and T-6 military trainers. Brewing Company. The all-day music lineup features East Bay Mudd, the Bay Area's premier rhythm and blues band, Celtic folk band Claddagh and surprise guests. The Half Moon Bay Pilots Association Saturday Night Tri-Tip Dinner (April 26) will feature a special tribute to Half Moon Bay's Eddie Andreini, recently named to the International Council of Air Shows Hall of Fame and one of the top stunt pilots in the world, plus live music by Rockabilly legend Dave Crimmen. The dinner is at the Andreini family hangar at the airport. Tickets are $30 per person, available at the door. Parking is on the airport field; enter off Capistrano Road. To show a car or other machine, the registration fee is $30 ($40 for entries postmarked after April 15) and includes a dash plaque and admission for two people. Spectator admission is $20 for adults, $10 for ages 11-17 and 65+, and $5 for kids age 10 and under. Tickets are available at the gate only. Half Moon Bay Airport, at 9850 N. Cabrillo Highway, is located on Highway 1, about 20 miles south of San Francisco and 5 miles north of Highway 92. The show benefits the Coastside Adult Day Health Center. •An opening military Color Guard to kick off the festivities. •The west coast's biggest, baddest gathering of the world's coolest cars. •Magnificent military aircraft including the P-38 Lightning, B-25 Bomber, C-47 Skytrain, P-51 Mustang, Hawker Seafury and F-4 Corsair plus YAK Russian fighters and an impressive array of T-6 and T-28 military fighters and trainers. •Super sleek speed machines, streamliners, motorcycles and hydroplanes in “World Record Wonderland”. •Jaw-dropping flyovers by historic military aircraft throughout the event. •"Dynojet" dynamometer engine performance testing. •A special display of antique wooden boats. •A multitude of Ford Mustangs to celebrate the iconic muscle cars' 50th year anniversary. •The one-of-a-kind Blastolene Brothers extreme, mega-modified machines. •The KISS Tribute Harley, a rolling tribute to one of rock’s most enduring and iconic bands. •Aerobatics great Eddie Andreini doing fly-overs in his bi-plane, YAK Russian fighter and P-51 Mustang. •Ultra thrilling rides in helicopters, bi-planes, Beech 18 and T-6 military trainers. •Kid’s amusements with a Zip-line, bungee jump, mechanical bull, remote-controlled NASCAR racing. •Fabulous food and drinks with Half Moon Bay Brewing Company’s special Motor Head Ale. •Live music with headliners East Bay Mudd and Claddagh bands. •Half Moon Bay Pilots Association Saturday Tri-Tip Dinner at the Andreini Family Hangar (April 26, 5:30 pm). Featuring a special tribute to Half Moon Bay's Eddie Andreini, recently named to the International Council of Air Shows Hall of Fame and one of the top stunt pilots in the world, along with music by rockabilly legend Dave Crimmen. Tickets are $30 per person, available at the door. Parking is on the airport field; enter off Capistrano Rd.